Josh Brolin is going to have an absolutely massive year. Not only is he playing the Mad Titan Thanos in Avengers: Infinity War, but he's also going to be playing Cable, the fan-favorite mutant who travels through time, in Deadpool 2. That means he's got a super meaty role in two of the biggest movies of the summer. But which role does he prefer playing? The actor has finally weighed in. 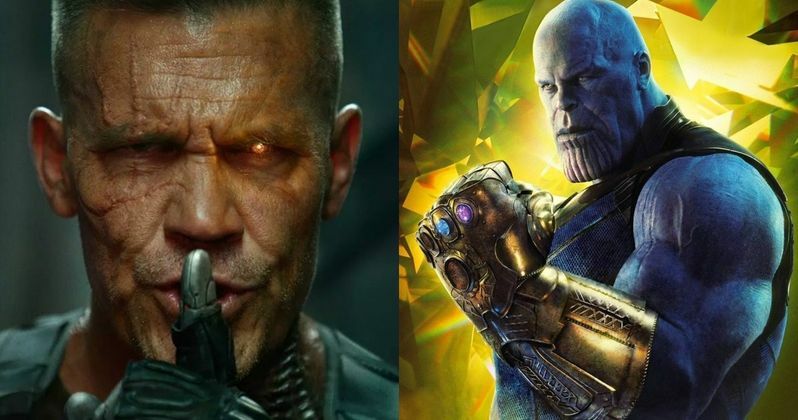 During a recent interview for the most recent issue of Total Film Magazine, Josh Brolin was asked point blank about whether he prefers playing Thanos or Cable. While he doesn't in any way slight playing Cable in Deadpool 2, he somewhat surprisingly says that he prefers Thanos, but his reasoning makes sense, from an actor's perspective. Here's what he had to say about it. "Look, I really like doing Cable, and it's practical. But I think if I was to have a preference, it'd be Thanos, just because my expectation was pretty low, given that I just thought I was a prop. And it was quite the opposite, having seen enough of the movie and realized how cutting edge this technical process is, y'know? I was watching me. I was watching every twitch, every blink. I was watching my eyes. My actions. I was living through my intentions. At the beginning, before I said yes, I called Mark Ruffalo and I said, 'What do you think of this?' He was like, 'It's going to be really uncomfortable in the beginning, and then you see the movie, and you'll just be absolutely blown away by the stuff you were doing.' And that was then. They made huge leaps and bounds in mo-cap territory since then. There's nothing not authentic about it." Performers like Andy Serkis (War for the Planet of the Apes, Star Wars: The Last Jedi) have helped pushed motion capture technology to become something much more than just using a human as a physical reference point for a digital creation. That means, Josh Brolin, one of the truly top-notch actors working today, really got to inject himself into the role of Thanos. This is a character that Marvel fans have been waiting a very long time to see, and it's good to know that Brolin feels he actually got to play the part in Avengers: Infinity War and wasn't just a "prop," as he puts it. As for Cable? We know with near certainty that we are going to see Josh Brolin suit up as him again beyond Deadpool 2. While the Disney/Fox merger may mess with some of the plans that have been laid out for the X-Men franchise, if fans really respond to his chemistry with Ryan Reynolds' Wade Wilson, it's unlikely Disney, a company that really likes making money, will turn away from that. We're first going to see Thanos in Avengers: Infinity War on April 27, followed by Cable in Deadpool 2 on May 18. We know which character Brolin likes playing more, but which one are fans going to respond to? This news was previously reported by Comicbookmovie.com.